The Tale of Tokhtamysh’s Campaign Against Moscow. After Mamai’s defeat at Kulikovo Field Khan Tokhtamysh seized power in the Horde. Realising that the victory over Mamai could mean a radical change in the attitude of the Russian princes to the Horde, Tokhtamysh undertook a campaign against Moscow in 1382. Due to the unconcerted action of the Russian princes, the depletion of the Russian forces as a result of the Battle of Kulikovo and some tactical errors, Moscow was captured by the Mongols and cruelly devastated. 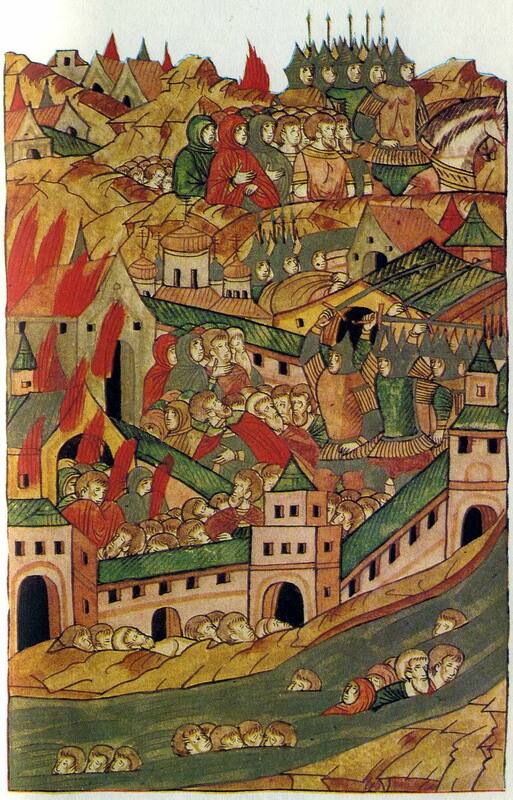 After a short time in Moscow, Tokhtamysh returned to the Horde, devastating the principality of Ryazan on the way, although the Prince of Ryazan had assisted Tokhtamysh when his army was advancing on Moscow. Tokhtamysh’s invasion is the subject of a chronicle tale in several versions. The chronology and correlation of the above-mentioned compilations are such that the short chronicle tale appears to be primary.20 However, the reverse may be the case. In certain parts of the short tale one can detect the condensation of a fuller primary text (i.e., the text of the extended story). The details of Tokhtamysh’s invasion found in the extended chronicle tale and absent in the short one suggest not later inventions, but the testimony of a contemporary or even eyewitness of what is being described. Stylistically the extended tale is a self-contained text. Thus, there are equal grounds for seeing the short story as a condensation of the extended one. That is to say, we can assume that The Tale of Tokhtamysh’s Campaign Against Moscow was created independently of the chronicles and only included in them later: its short form in the compilation of 1408 and its extended form in that of 1448. The short chronicle tale with some rearrangements and slight textual variations is included in full in the extended one. All this gives grounds for assuming that the author was a Muscovite, someone connected with the trading world, who witnessed the events which he describes and did not have to borrow from the chronicle-writing of the prince or the Metropoli­tan. The vivid narrative combining lively descriptions of real events with rhetorical passages, the stylistic repetitions and contrasts testify to the literary talent of the unknown author of the Tale. On the site where the Spassky Tower of the Moscow Kremlin now stands.